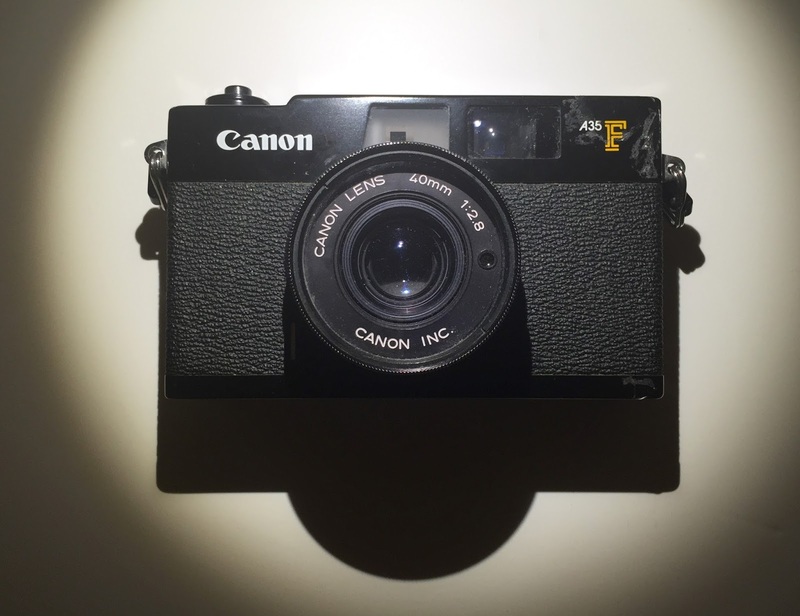 My latest camera find is a super clean Canon A35 F. This is a classic rangefinder in the same line / family as the very popular Canonet. I've never had a Canon F, so I was really surprised when I found this during my routine check at my local Goodwill Outlet. It was dusty & dirty, but it cleaned up nicely. The batteries were dead (one for the meter & one for the popup flash) but the battery compartment is clean. The lens, a 40mm f/2.8 was protected by a clear lens filter. All the moving parts seemed to work, except the ASA selector knob which appears to be sluggish. It's set at 400 right now, so that's what I use most of the time so this shouldn't pose issues. I loaded it with new batteries tonight and the light meter appears to work. This is going to be a fun camera to shoot. It's the same size as my now dead Canonet, so the size is just right.